Video games have shown us that the mind is capable of creating amazing worlds, engrossing atmospheres, and if not well-paced stories, at least ones that inspire players to fill in the blanks with their own imaginations. 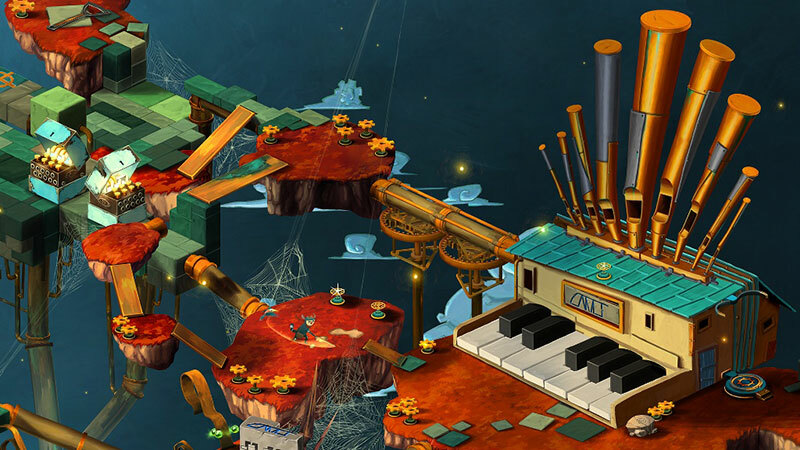 Bedtime Digital Games’ adventure title Figment attempts something even bolder, exploring the mysterious intricacies of the most complex organ in the known universe via some colorful puzzle solving and a tinge of light sword swinging. Depicting the inner workings of the brain is an ambitious task, and the effort here is sincere on all fronts. Disappointingly, the opportunity for wild creativity is mostly squandered, both in look and play, and the result is neither left brain nor right, neither poor nor outstanding; there are few examples of how hard it is to make a great game better than those that turn out merely average. There’s nothing wrong with being perfectly acceptable, however; we are what we are, and in the case of Figment, there’s some decent puzzle fun to be had in that. Most games involving a trip into the brain deal with human issues of one kind or another, and this case is no different. After a brief prologue in which a real-world traumatic experience is hinted at, the story transitions to the mind, where Dusty, a former voice of courage, is a young hero behaving like an old recluse protective of his lawn. Goaded (and guilted) into action by his chirping bird friend, Piper, he sets off to rid his land of the Nightmares who have infected it. This game has a fairly straightforward setup, and from the moment the first Nightmare sings his song warning of the eventual loss of all things, Figment‘s simple treatment of its themes becomes readily apparent; this one won’t exactly leave players scratching their heads over pondering philosophical musings. Still, there’s a frankness that is endearing, and the personalities of the villains are distinct and often amusing. Dusty and Piper don’t fare quite as well, with forced banter permeating throughout the adventure that tends to miss the mark in tone and timing, but they otherwise make for amiable, if forgettable, companions. I couldn’t help but think that their many brief conversations presented opportunities to really delve into the mental issues Figment seems to want to address, but too much time is spent on humor — and not in a good way. The various puns (sometimes clever) and fart jokes (not as much) come at the expense of ultimately saying anything interesting; Figment seems to have a tendency to fear its own potential at times. This idea seems particularly true in the visuals. Though the hand-drawn assets are colorful and skillfully done, attempts at depicting abstract concepts in picture form stick mostly with proven tropes seen countless times. The logical side of the brain sees an abundance of cogs, clocks, and other meticulous machinery, while the creative side is littered with green grass, blue skies, and an abundance of musical instruments. The floating islands connecting each section also present the possibility for elaborate pathways full of twists and turns that could represent the impenetrable secrets ahead, or the knotted damage the numerous psychoses have wreaked. At times Figment reaches for a blend of Dr. Seuss and M.C. Escher, but never without keeping both feet on the ground. It’s fine but feels like it’s missing something as if the developers were cautiously keeping the imagery grounded when it wanted to soar. But ultimately games are for playing, and happily, Figment is strongest when it has something for your mind to do. It rarely holds your hand, often presenting problems and solutions without direct explanation as to how the two relate, and these moments are the most engaging. There were times when I was genuinely mystified as to how to proceed, yet everything necessary to move on was there, if only I would stop for a moment and open my eyes. Combat comes off as an afterthought, as if thrown in to fill gaps between mental challenges; it’s largely unneeded, even in boss fights. Still, even the more mundane tasks in Figment are made palatable thanks to a lively soundtrack and pleasant sounds. Music is clearly a big theme, with bosses whose attacks sometimes strike to the beat as the songs they sing convey the irrational fears they exploit. Again though, this seems like an opportunity passed by, as the game never explores or takes advantage of this idea in any meaningful way other than passive listening. Am I sounding like a broken record? 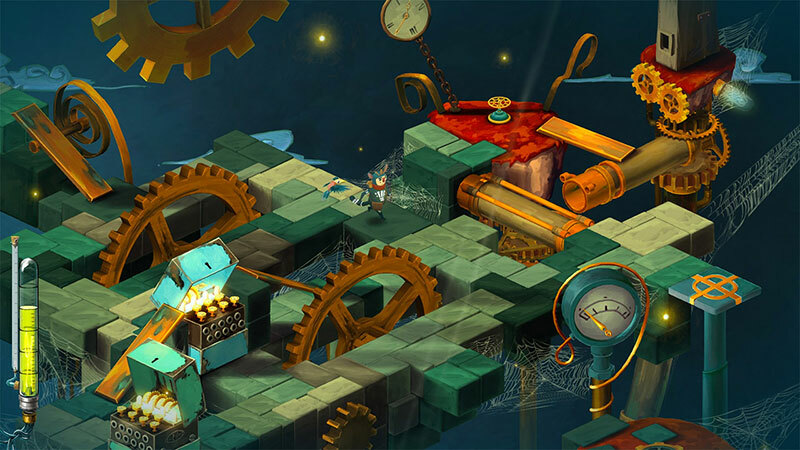 I don’t mean to be too negative; those who love their puzzle games with a little adventure should at least take a look at Figment to see if it catches their eye. While never ambitious in execution, its aspirations are sincere, and there is enough cleverness to scratch the problem-solving itch. But I could imagine so much more.